We have just launched a complete range of inflatable structures which have been designed for outdoor exhibitions and experiential marketing events. Designed to attract attention, stand out, create an impact, engage visitors and promote your brand. Our versatile range offers a complete solution for event marketing and is perfect for increasing your brand awareness. Our inflatable event structures are fully customisable, offer limitless branding opportunity and can be used time and time again. Inflatable advertising has the potential to create a huge impact on your company’s corporate and professional image. The large format shapes and full-colour printing offer maximum brand visibility. The inflatable range includes inflatable arches, events tent, inflatable columns and advertising balloons as well as an ultra-modern and stylish inflatable furniture range. Innovation is at the heart of everything we do at XL Displays which is why we offer an extensive range of promotional products which enables our customers to engage in experiential marketing to better promote their brands. We offer inflatable structures which have been designed to create striking inflatable advertising displays for experiential marketing events. Fully customised with your artwork, choose from a range of shapes, styles and sizes to suit any indoor or outdoor event. Shop our full range of inflatable structures. Our inflatable arches are available in 5 widths – 4m, 6m, 8m, 10m and 12m – and three shapes – rectangular, round or angled. 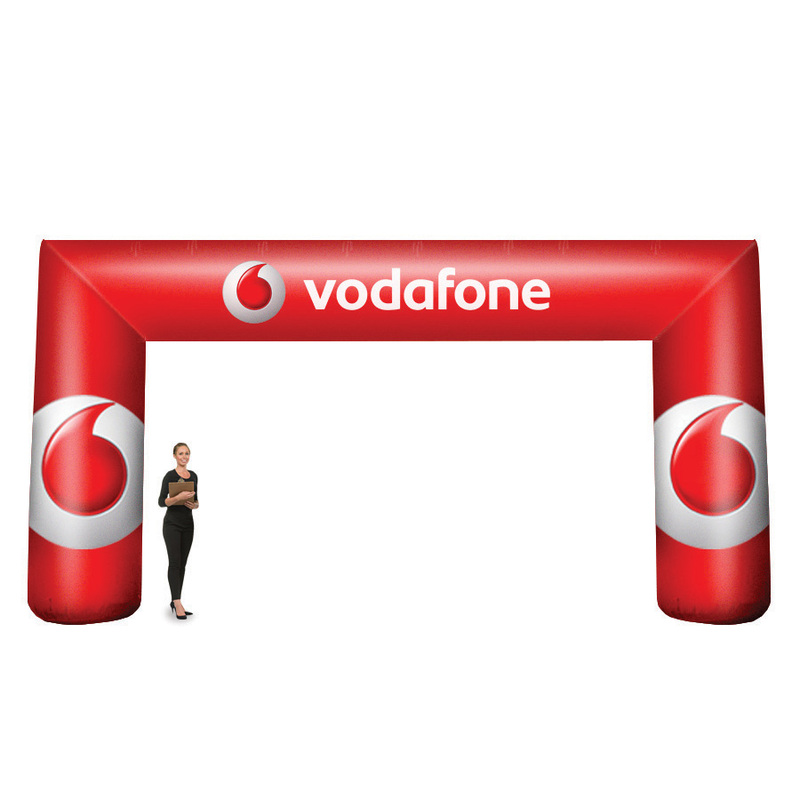 Inflatable advertising arches make the perfect start/finish line for race or marathon events and are especially popular with triathlon, athletic, sporting and motor sport clubs. They can be used to create a branded entrance or exit at any outdoor event, exhibition, charity event, trade show, country club or county show. Our inflatable arches can be custom printed with your artwork and provide a large print area for better promoting your brand. Manufactured from an ultra-strong PVC material which is fully weatherproof each arch is supplied with everything you need for immediate use. The kit includes rope and pegs for anchoring down the inflatable arch. The cold air system requires a constant air supply to stay inflated. The inflation fan is fitted within the inflatable structure, so you simply plug the power cable into mains power and switch on to inflate. The power cable exits the inflatable structure at the bottom through the Velcro section, this means there is no unsightly fan outside the structure and keeps the display area neat and tidy. We can supply custom arches in any shape or size and we can match any Pantone or CMYK colour so if you require a bespoke inflatable arch please call us on 01733 511030. Inflatable columns and advertising balloons are the perfect promotional solution if you want to create a dramatic branded presence for your event. The large inflatable structures provide maximum marketing opportunity and brand visibility. Ideal for a whole range of marketing exhibitions and events, such as trade shows, store openings, sale promotions and new product launches. The inflatable advertising balloons are available in 3 sizes – 4m, 5m and 6m high. The large inflatable structures are supplied with everything required for immediate use. The inflation fan is pre-installed within the inflatable structure with only the power cable exiting through the Velcro opening. This creates a tidy display area with no unsightly fans or motors on show. It requires constant airflow for inflation so will need to remain switched on at the mains during use. Manufactured from an ultra-durable 320g PVC material which is fully waterproof. Fully customised with your branding from top to bottom, giving you a highly visible advertising balloon with maximum marketing impact. Our inflatable columns are available in two sizes - 2m and 3m high. The inflatable advertising columns provide 360° brand visibility and marketing opportunity. The inflatable columns are manufactured from a hardwearing 200g PVC material which is waterproof and B1 fire certified. Supplied with a wooden base which provides a sturdy support for the inflatable structure, the printed PVC material is attached to the wooden base with ultra-strong Velcro. 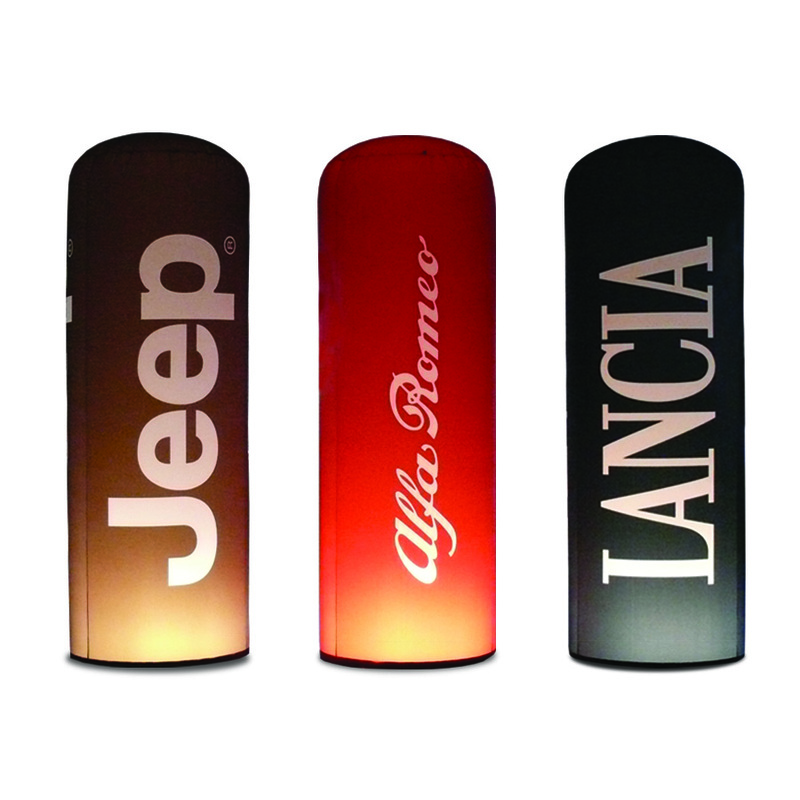 You can choose to add internal lighting to the inflatable column for no extra cost, this illuminates your marketing message from within and highlights your branding. If you require a bespoke inflatable we can custom make your inflatable event structure to suit any shape, size and colour. We can print to any Pantone or CYMK colour which is ideal for brand matching. For more information on custom bespoke inflatables please call us on 01733 511030. We offer three versatile event tent solutions which have been designed to attract attention and maximise your brand visibility; provide secure shelter which is weatherproof and wind resistant; and provide the opportunity for your brand to create a marketing experience by engaging and interacting with visitors. The X-GLOO inflatable event tent offers limitless brand and marketing opportunity. It’s the ideal solution for any company wanting to take its brand to the next level. Available in four sizes – 4x4m, 5x5m, 6x6m and 8x8m. The X-GLOO has been designed with quality and functionality in mind. The attention to detail is apparent with the simple set up and ease of use, making it effortless to use. Additionally, it is waterproof, fire retardant, UV resistant and stable in winds up to 60 km/h (when using the correct anchoring system). Thanks to its aerodynamic form, the X-GLOO event tent is perfectly suited to both indoor and outdoor events. Fully customisable with endless branding possibilities, almost every surface of the X-GLOO can be printed with your artwork. The unique block building system provides maximum versatility and convenience. Optional walls, tunnel parts and canopies can be zipped on to create something bespoke, giving you an event tent that can grow with your business needs. The Signus ONE inflatable pavilion provides a truly eye-catching customer experience. Perfect for hospitality and experiential marketing events where you want visitors to be attracted and engaged with your brand. The interesting shape offers a unique experience and the construction features an inflatable frame and interchangeable cloths. Signus ONE’s clever design makes it look like it is a one-piece structure but it is made up of three layers. It features an inflatable frame in black or grey, and two layers of roof cloths. The first layer of roof cloths is a water repellent, plain white fabric which is recommended when the Signus is used outdoors. The second layer of the roof is a custom printed fabric cover for maximising brand exposure. Each fabric layer consists of three kite-shaped roof cloths which join onto the frame to create the cover. Effortlessly set up using the supplied electric pump. The Signus ONE comes with a complete accessory kit which includes everything you need to store, transport, inflate and anchor down the Signus ONE when in use. Branded gazebos are a popular choice for outdoor exhibition and events. Chosen for stability, branding ability and versatility, they are the ideal event tent solution. Available in 4 sizes – 2m x 2m, 3m x 3m, 3m x 4.5m and 3m x 6m. We offer our branded pop up gazebos in a variety of configurations. Choose from a combination of printed canopy, back wall, half side walls and full side walls. The quality hard-wearing aluminium frame is resistant to rust and provides a sturdy frame for your customised accessories. The fully branded cover is made from 195gsm Polyester tent fabric which is waterproof and has B1 fire retardant certification. The dye-sublimation printing process provides exceptional print detail which is ideal for reflecting the quality of your brand. A pop up gazebo provides instant shelter at any outdoor event, from sporting events to county shows, outdoor exhibitions to country fairs. Whatever the Great British weather provides, you will be protected from the sun and sheltered from the rain. Our inflatable furniture range is ultra-modern, sleek and has been designed to create a contemporary aesthetic which is very desirable. Perfect for hospitality and experiential marketing events. Thanks to the dye-sublimation printing, the possibilities of customisation are endless: large logos, patterns or images can be printed across the entire surface of the inflatable furniture. Our inflatable furniture range includes an inflatable chair, inflatable sofa, inflatable stool and an inflatable table. The table can also conveniently be used as a pouffe which can comfortably seat up to three people. The Fugu inflatable furniture range is manufactured using a highly durable and resistant TPU Thermoplastic Polyurethane. 100% recyclable and completely odourless, this material has been chosen for its reliability and robust properties and has been used in the marine industry for over 30 years. Resistant to abrasions, this material is extremely elastic providing you with a supportive yet comfortable seat. The hardwearing material used far surpasses the properties of cheaper inflatable furniture and has been engineered for use in any kind of climate - hot and cold. Effortlessly inflated using the electric pump. The inflatable furniture set comes with an electric pump which enables fast and easy installation. Supplied as individual furniture or as a part of an inflatable furniture set, we offer two variations of our FUGU inflatable furniture - branded or crystal clear. 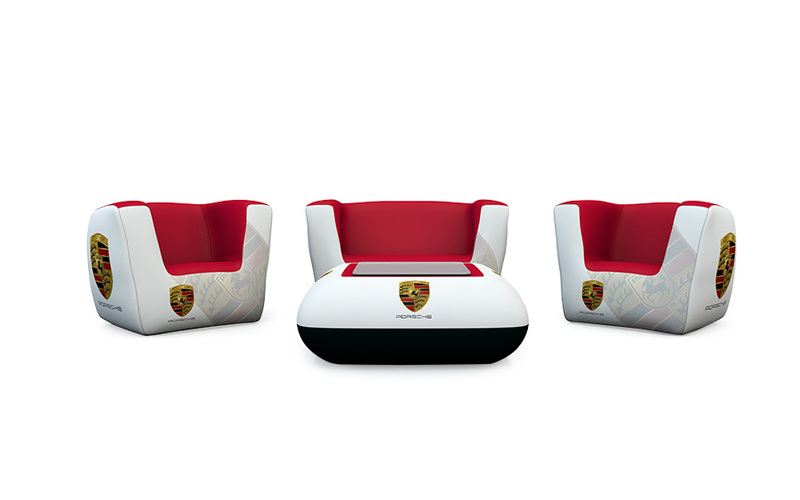 Our branded inflatable furniture features a dye-sublimation printed cover. This is where ink is printed directly into the fabric and creates exceptional photo quality detail. The 250gram stretch polyester material is easy to remove, this allows you to switch your design or branding for different events. Alternatively, you can remove the printed graphic altogether for an unbranded look, this reveals the crystal-clear base underneath. The crystal-clear inflatable furniture is completely see-through and provides an ultra-modern appearance, almost futuristic. The see-through crystal-clear finish allows you to fully illuminate your inflatable furniture with the optional LED lamp. Create a sophisticated ambience for your event seating area and prolong your event into the night. For more information on our inflatable structures contact us or call us on 01733 511030.